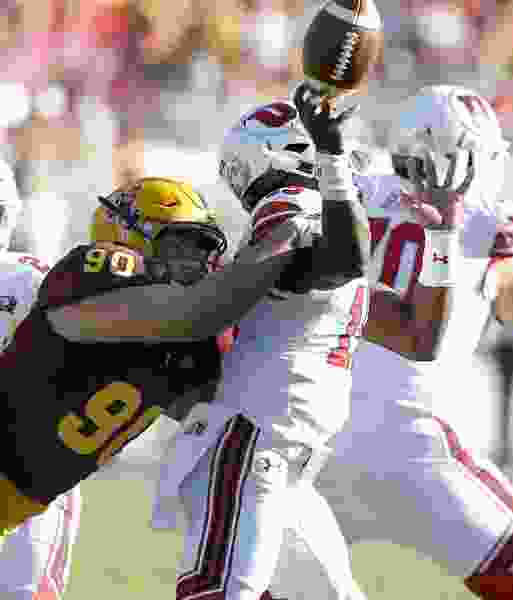 Tempe, Ariz. • Utah quarterback Tyler Huntley’s four-interception day in a loss to Arizona State last season was discouraging enough, but his experience Saturday at Sun Devil Stadium was even rougher. Huntley injured his collarbone and likely will be sidelined for the season, coach Kyle Whittingham said. ASU tacklers drove him into the grass after he launched an incompletion under pressure late in the third quarter of the Sun Devils' 38-20 victory. Needing to win their two remaining Pac-12 games vs. Oregon and Colorado and get help from one of ASU's opponents to win the Pac-12 South title, the Utes will turn to redshirt freshman Jason Shelley. He had never played in a meaningful situation for Utah until Saturday, when he completed his first two passes on a drive that led to a field goal, bringing his team within 21-20. Shelley went 2 of 9 after that, with his last pass being intercepted as ASU's Kobe Williams wrestled the ball away from Ute receiver Samson Nacua in the end zone. Former walk-on Drew Lisk becomes Utah's No. 2 QB; former high school quarterbacks Chase Hansen and Britain Covey could be trained for emergency use. The Utes have a vastly different depth chart than last season, when then-senior Troy Williams started three conference games in two stints while Huntley was injured. Lisk is “the only other quarterback in the program,” Ute coach Kyle Whittingham said wryly, in reference to freshman Jack Tuttle's mid-October departure. Tuttle is gone, partly because Utah’s coaching staff ranked Shelley above him. Shelley had played in three games prior to Saturday, appearing in the fourth quarters of wins over Weber State, Arizona and UCLA with mixed results. Shelley “has complete command of the offense,” Whittingham said. “I was confident this game; I’m always confident,” Shelley said of his fill-in role against ASU. Shelley is from the Dallas-Fort Worth area. Ute receiver Jaylen Dixon was his high school teammate. Shelley made an impressive debut against Weber State in August, although the outcome was decided by then. He produced a 40-yard completion and a 40-yard run on two of his first seven snaps in college. The Utes will need everything he can give them, the rest of November.